Two of Nissan's latest GT Academy graduates are going for the Blancpain Endurance Series final round, vying for titles in teh Pro-Am class of this 2013 series. Nissan and Ferrari are only one point apart in this breakneck series. Plus watch a video interview of Steve Doherty about the race. This is shaping up to be a big weekend for NISMO and Nissan's racing teams. The final round of the Blancpain Endurance Series will begin and two new graduates of the Nissan GT Academy will be there with two cars. The No 35 GT-R NISMO GT3 will be piloted by Lucas Ordonez, Wolfgang Reip and Peter Pyzera. The No 32 GT-R will be driven by Alex Buncombe, Mark Shulzhitsky and Jann Mardenborough - who also competes in the British F3 International Series at Nurburgring this weekend, pulling double duty. This final event in the Blancpain series is a one-off 1000kms race, making tactics and strategy key. The Ferrari and Nissan teams are only one point apart and the race winner receives 33 points, so the battle will be intense. Neither Lucas nor Pyzera have competed on the Nurburgring, but are confident that their many experiences on track days there will pay off now. "It's a long race so anything can happen but I will be racing with the championship in my mind," said Lucas. "It will be a tough track for us so we really need to nail the set up. I've not actually raced on the Grand Prix track before but I have done many driving events there. I won my class at the Nurburgring 24 Hours in 2012 though so it is a good place for me. This is a very important event for me, for Nissan and for GT Academy. It has been a very busy and very exciting year and I hope we can finish it with a championship in our hands." "I really like the atmosphere at the Nurburgring and that fact that this is my home race makes a big difference to me," said Peter. "It is only two hours from my home so I hope to get a lot of local support. I have a good feeling about this race. To be honest the only time I haven't had a good feeling before a race was at Ricard and that didn't go well at all! This is my first season as a racing driver and we are going to the last race leading the championship. I'm very proud to be part of this team and I hope we can hit our targets at the Nurburgring. It would be great to stay in front of Ferrari and maybe get a podium. To win the championship would be fantastic so like always I will give 100% and see what happens." Also on the track this weekend will be the NISMO Exchange with Kazuki Hoshino getting into the No 23 JRM Racing GT-R with Peter Dumbreck and Steven Kane. This insertion of Hoshino is part of Nissan's NISMO Global Driver Exchange, which keeps an open pool of drivers to fill in or trade out into various teams to broaden the individual drivers' experiences as well as fill out the teams with varied talent. In another race, this time at Silverstone in the UK, two other GT Academy graduates are vying for a prize. Both Salman Al Khater and Ashley Oldfield, 2012 GT Academy winners, and whose past year has been spent in the intense driver development program at NISMO, are now ready for international competition. They'll be driving a 370Z NISMO GT4 race car at Silverstone along with veteran driver Tomas Scheckter for the Silverstone 1000kms. Finally, American GT Academy graduate and 2012 champion Steve Doherty will also be at Nurburgring this weekend. 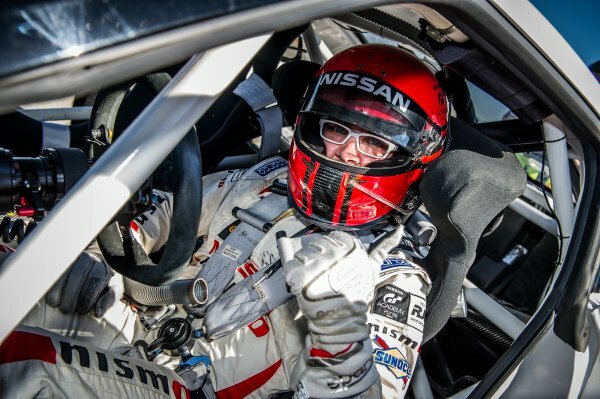 During the Nissan 360 in Irvine, California last weekend, Nissan's Coco Masters interviewed the 30-year-old driver who's finally made his dream. During that interview, the take a few laps in a GT-R NISMO GT3. Doherty will feature in next season's GT Academy series as a mentor to the new arrivals who will go from video game champions to real-world race champs.